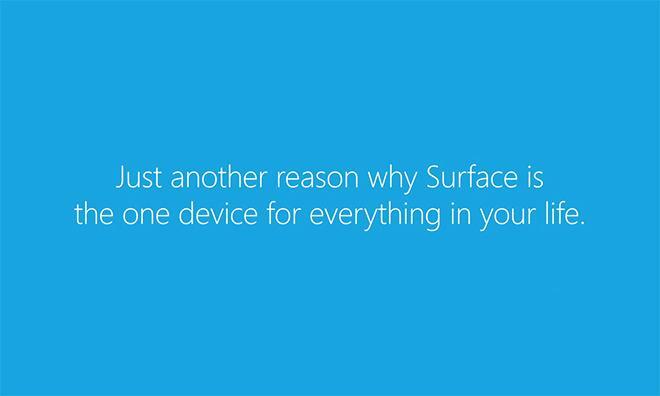 Screenshot from Microsoft's latest Surface 2 ad. The ad goes just about as expected, with an A/B comparison of the Surface 2 and Apple's latest iPad Air, but this time Microsoft peppers a few new points into its usual "no kickstand and keyboard" drone. Microsoft's first ad, embedded below, starts out with the tagline, "Surface has great support for hands-free cooking, iPad doesn't." The Bing Food and Drink app is touted as an optimal solution for all kitchen activities, what with a built-in kickstand to keep the tablet off dirty countertops. The app's hands-free mode lets users wave their presumably filthy hands in front of the Surface 2's camera to turn pages in a virtual recipe book. According to Bing's website, the air gestures can be used to flip between instructional steps. Now the iPad. "Free apps on the iPad don't offer the same hands-free technology," the narrator says. "Even after purchasing a hands-free recipe app, the voice command requires a quiet room to work properly." Microsoft chose iCookbook, a $4.99 voice-controlled recipe app, as its whipping boy. A quick search in the iOS App Store yields a number of alternatives, however, like the $0.99 RecipePad that turns pages when a user bumps on the kitchen counter. In the second ad, Microsoft trumpets the Surface 2's multi-user capabilities, which not only allow more than one person to have a customized home screen and apps, but can also monitor other user activity with auto-generated reports. Apple's iPad does not support said features. Microsoft's ads are just the latest in a campaign that is more about comparing than focusing on the Surface 2's qualities.